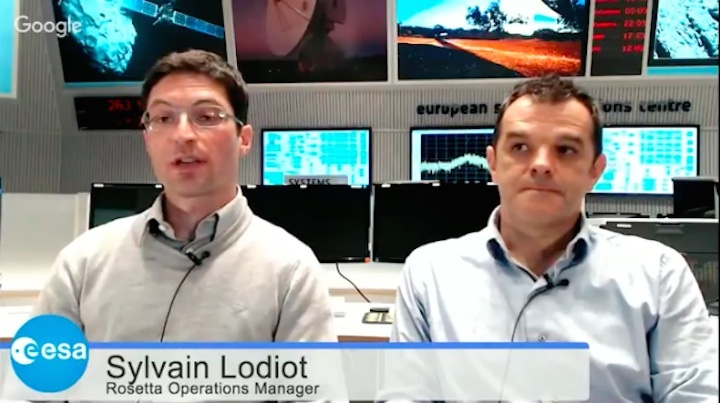 Today's blog post features detailed information on the intense, behind-the-scenes activities during Rosetta's final weeks, courtesy of Sylvain Lodiot, Spacecraft Operations Manager, at ESOC, and Laurence O'Rourke, Rosetta Science Ground Segment – Science Operations Coordinator, at ESAC. Far from going gently into that good night, the final weeks of Rosetta’s incredible journey are proving to be some of the most demanding for the mission control team at ESOC, ESA’s operations centre in Darmstadt, Germany. With the final descent profile and impact site selected (we’ll aim for Ma’at, an area containing several active ‘pits’ from where a number of the comet’s dust jets originate – see “Rosetta’s descent towards region of active pits”), and with the date and time for touch down set (planned for within 20 minutes of 10:40 UTC on 30 September, time at the comet – see footnote at the end of this post), the mission control team is now steering the craft through some of the most demanding manoeuvres since arrival at Comet 67P/C-G in August 2014. 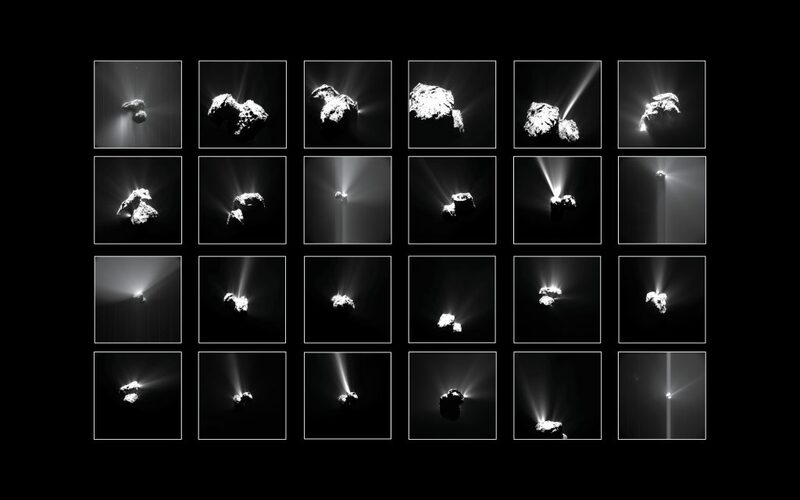 Since 9 August 2016, Rosetta has been operating in a new ‘flyover regime’ that is taking the spacecraft as close as possible to the comet’s surface for a planned total of 15 very close flyovers, which are providing excellent opportunities for close-up science observations. To date, 13 close flyovers have been completed and two more (on Saturday, 17 September, and Tuesday, 20 September) are planned. 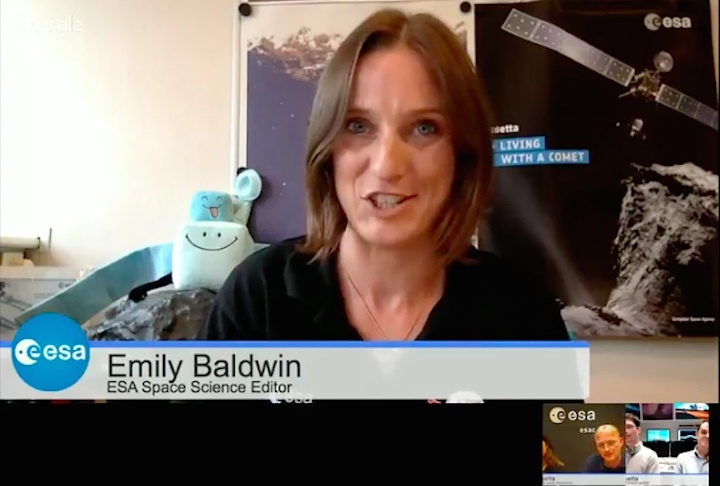 “On 5 September, we skimmed the comet just 3.9 km from its centre of mass, meaning we were about 1.9 km from the surface,” says Spacecraft Operations Manager Sylvain Lodiot. Flying so close to the comet means that, more so than ever, the comet’s irregular gravitational field cannot be ignored. For any orbits above approximately 7 km, models of the comet’s gravity enable Rosetta’s trajectory to be planned with exquisite accuracy – Rosetta can essentially be treated as orbiting an almost spherical body. However, flying closer means that any anomaly in the comet’s gravitational field (think: mountains) must increasingly be taken into account. As the comet is shaped roughly like a rubber duck, its gravitational field as ‘felt’ by the craft when so close is by no means constant from one point on any given orbit to the next. As the craft has not previously operated so close to the surface, the gravitational models used by the Flight Dynamics teams at ESOC to plan the trajectory and the necessary thrusters burns are giving increasingly large uncertainties. In the first week in September, Flight Dynamics were reporting that the error in pointing Rosetta (the craft’s pointing is vital as this determines instrument visibility of the comet and the direction for thrusters burns) was a whopping 8.0 degrees. This is insignificant if you’re using your phone to navigate to the local coffee shop, but is very large when controlling a spacecraft just a few thousand metres from a comet. 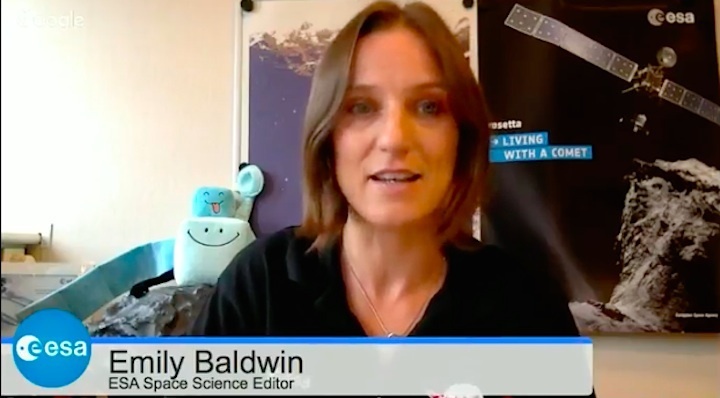 “Basically, we were really struggling when we were so close to the comet. We’ve never been there before and we just don’t know the local gravitational field,” says Sylvain. 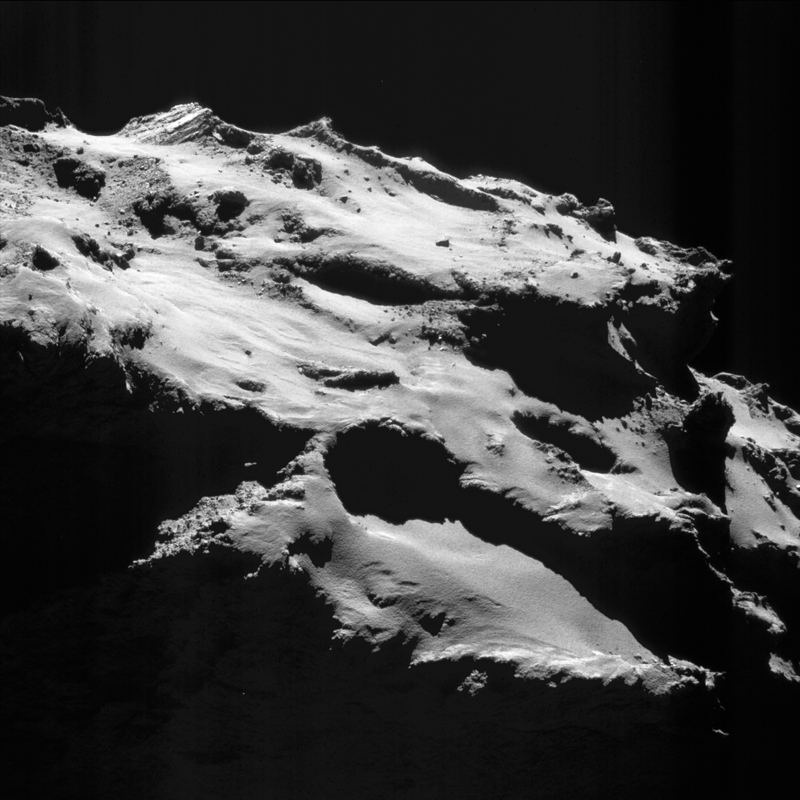 The now-famous ‘Philae found image’ is an example of unwanted off-pointing caused by gravitational disturbances. 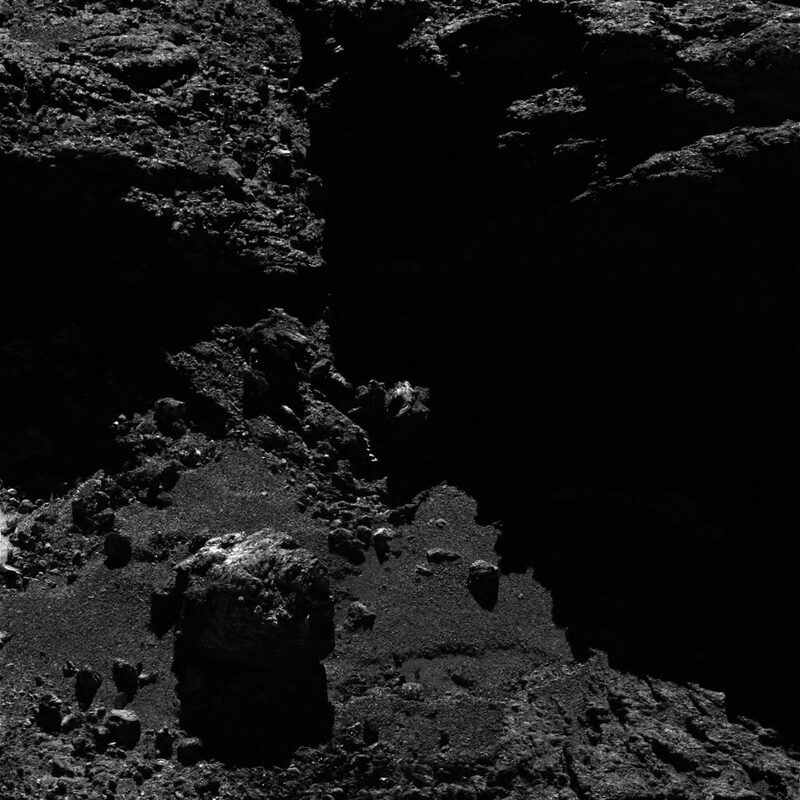 The image was meant to be centred on Philae’s deemed location, yet the lander actually appears at top-right, pushed to the side. The off-pointing is primarily due to the large gravitational disturbances with secondary effects from comet outgassing, among others. The remaining three close flybys will be executed through a series of almost-daily orbit correction manoeuvres that will provide thrust on the order of just a few mm/second. 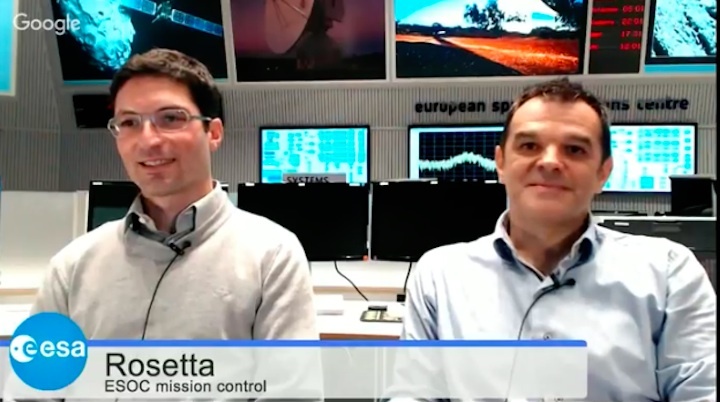 The close flyby regime has meant the flight controllers have had to adopt a tightly timed, 3-day planning cycle (to match Rosetta’s comet orbital period), which has been especially demanding for the flight dynamics specialists, who are now essentially working 7 days/week. Flight dynamics must gather the radiometric and optical data received from the ground tracking stations and the spacecraft, respectively, conduct a highly detailed and very accurate orbit determination, prepare the instructions for the resulting next set of manoeuvres and deliver these to the flight control team every three days. Then repeat. In the final week of the mission, this will be tightened up to just two days. By 26 September, with the close flyby phase complete, Rosetta will be commanded to arc out to an orbit 16 X 23 km from the comet centre, from where it will conduct the last thruster burn that will kick it onto the final descent. The final weeks of the mission are also very intensive for the science ground segment (SGS) team at ESA’s ESAC Establishment near Madrid, home to Rosetta science operations. The shorter, 3-day planning cycles have placed a large workload on the team as they interact with all instrument teams and the project scientist on a daily basis in order to extract the best science for the mission in these last few weeks. The fact that the science planning needs to take into account the gradual reduction of available power (see ‘Powering down’ below) and the falling data download rate makes this even more challenging. The impact of the reduced power being provided by the solar panels means that there are times when not all instruments can remain on in full science mode. Similarly, as the spacecraft gets further from Earth, so the rate at which data can be downlinked via the ground stations is being reduced, and this causes the instrument teams to have to reduce the amount of data they generate to stay within the margins given to them. Besides the planning of the weeks leading to the descent, the SGS team is now putting final touches on the preparation of the instrument science timeline to be executed during the final descent. 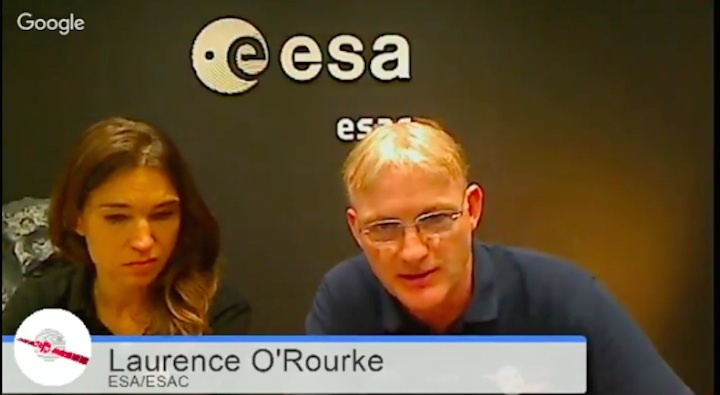 “This has proven to be highly challenging as not only are power issues at their most extreme in the final descent, but so, too, is the need to ensure that all science data generated are sent to ground in ‘real-time’ as contact will be lost with the spacecraft at touchdown,” says Laurence O’Rourke, SGS Science Operations Coordinator. “This means the SGS have set up a scenario to squeeze as much out of the instruments as possible, from as many instruments as possible, thus maximising the science output during this unique opportunity,” adds his colleague, Michael Kueppers, SGS Science Operations Coordinator. One example relates to planning for OSIRIS images. With the final pointing strategy to be performed by the spacecraft having been agreed between the flight control team at ESOC and the OSIRIS instrument team, the science operations team is now working with the OSIRIS scientists to ensure they can provide the optimum timing of commands for their camera to match with this, in order to produce the best images feasible of the surface before contact. As the timeline for instrument activities during descent is almost ready, and the associated command sets for all instruments are in preparation, the Science Operations team are expected to deliver the final set of instrument commands for the mission to ESOC on 23 September. At that point, preparations begin for the post-operations phase, in which a reduced team from the SGS will continue to work on Rosetta data archiving. More details on the final instrument timeline for the descent and the Science Operations team role in its creation, as well as in post-operations, will be provided in a blog post next week. One of the major issues facing the mission control team in the final weeks is precisely one of the big reasons why the mission is ending now: power. The further from the Sun, the less sunlight that falls on Rosetta’s pair of 16-m-long solar arrays, and every day, this is falling. 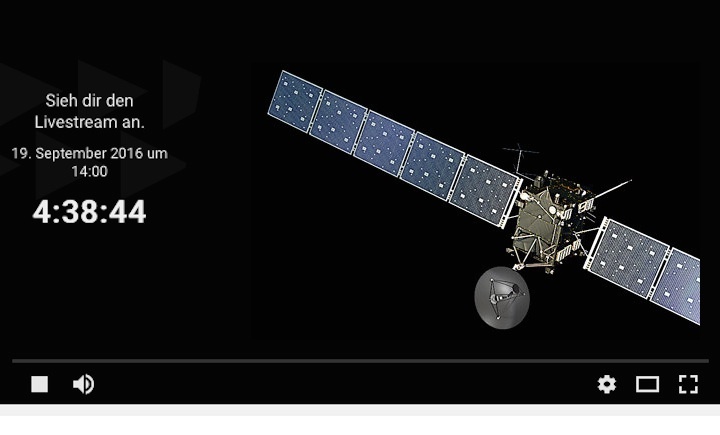 On 14 September, Rosetta was over 560 million km from the Sun and over 697 million km from Earth. Each day, these huge distances are increasing by around 1 million and 3 million km, respectively. 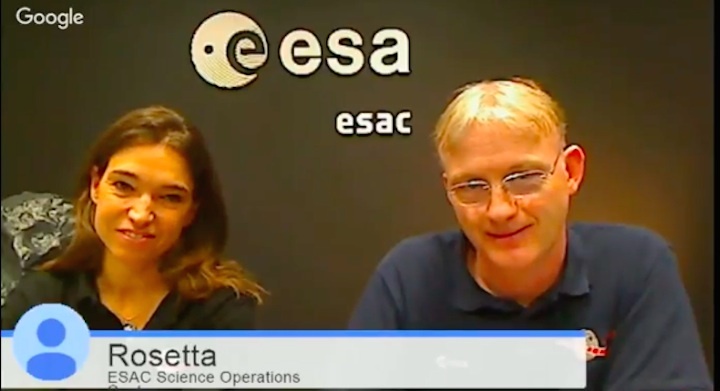 “On board Rosetta, we are seeing a reduction of 4 Watts of power each day. At the end of August, we were getting just 936 Watts, and we need a minimum of about 630 Watts simply to operate – this leaves about 300 for the instruments,” says Sylvain. At ESOC, several members of the Rosetta flight control team have already been assigned entirely or partly to work on other missions. On the morning of 4 October, the next working day after mission end (3 October is a national holiday in Germany), all of the team will report for work on other missions and the Rosetta flight control team will formally dissolve. 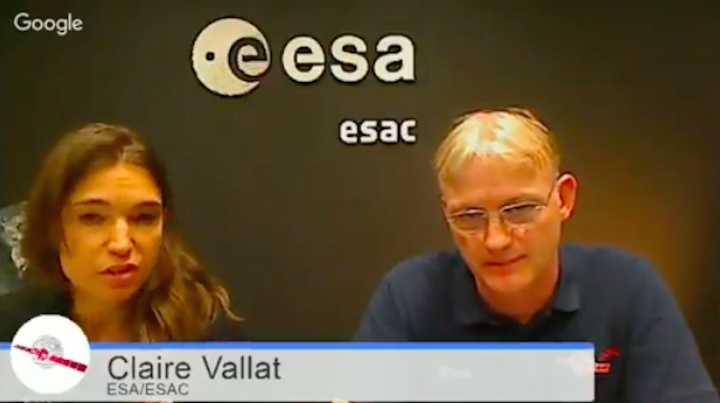 Sylvain himself, as spacecraft operations manager, will continue working on Rosetta for a few more weeks, to write the post-mission report and arrange for the mission flight data to be transferred for long-term archiving at ESAC. At ESOC, in addition to the 12 missions (18 spacecraft) currently in flight , teams are actively working on ten future missions, including Juice, BepiColombo and Solar Orbiter (see “Ground segment: preparing for launch”). The intense operation activities at ESOC will continue until the very end. At 20:50 UTC on 29 September, Rosetta will fire its thrusters for about three minutes – the ‘last burn’ – from an altitude of about 19 km, tipping itself onto the final descent trajectory. Rosetta’s last week at the comet. Click for full caption. The on-board commands that will trigger ‘passivation’ upon impact will be activated around three hours before impact. 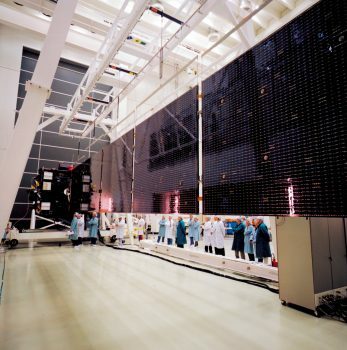 These will ensure that, as soon as Rosetta hits the surface, its main systems are turned off, including the attitude and control systems, as well as the main transmitter, the latter in order to meet regulations aimed at avoiding interference on deep space network communications channels. 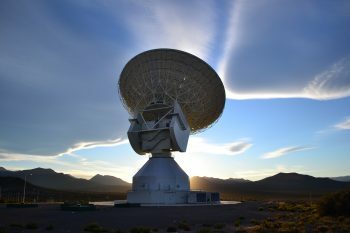 Shortly after 08:00 UTC in the morning of 30 September, the final set of commands will be uploaded, transmitted via NASA’s 70m deep-space dish at Madrid. These will include an optimized pointing profile for the final descent based on a final orbit determination doen after the previous evening’s final burn. 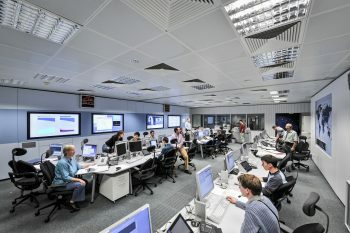 The flight control team will be on duty in the Main Control Room at ESOC on 30 September, monitoring the craft’s final hours and helping ensure receipt of the last data sets from the instruments as the comet looms steadily closer. Impact is expected to occur on 30 September at 10:40 UTC at the comet, with an estimated error of ± 20 minutes. As the signal travel time between Comet 67P/C-G and Earth on that day will be 40 minutes, confirmation of impact is expected at ESOC at 11:20 UTC / 13:20 CEST, again with an estimated error of ± 20 minutes. This uncertainty will be reduced as the end of the mission approaches (all times are subject to change). As soon as Rosetta hits the surface, the craft will be passivated, autonomously on board... And that will be the end of the Rosetta mission. This week's CometWatch entry is a double feature, with two images of Comet 67P/Churyumov-Gerasimenko from Rosetta's NAVCAM taken on 31 August and 11 September 2016, when the spacecraft was 8.8 and 9.8 km, respectively, from the centre of the comet nucleus. The 31 August image provides a dramatic view on the steep slopes of the Hathor region, on the small comet lobe. Hathor consists of a 900-m high cliff sloping down towards the comet's neck, and is characterised by marked linear features, streaks and even small terraces. A hint of the dust-covered Ma'at region can be seen towards the right edge of the frame; Rosetta's landing site, on Ma'at, is beyond the right frame of the image. 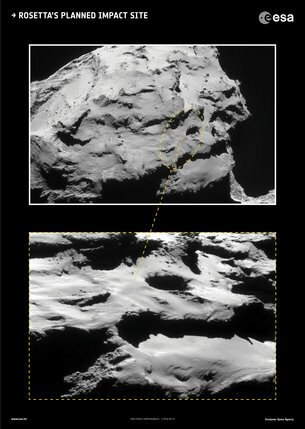 In the top left corner, a portion of the smooth terrains of Hapi is also visible: located on the comet's neck, Hapi is covered in dusty material and punctuated with boulders. The 11 September image, instead, portrays a piece of the Wosret region, on the opposite side of the small comet lobe with respect to Hathor. 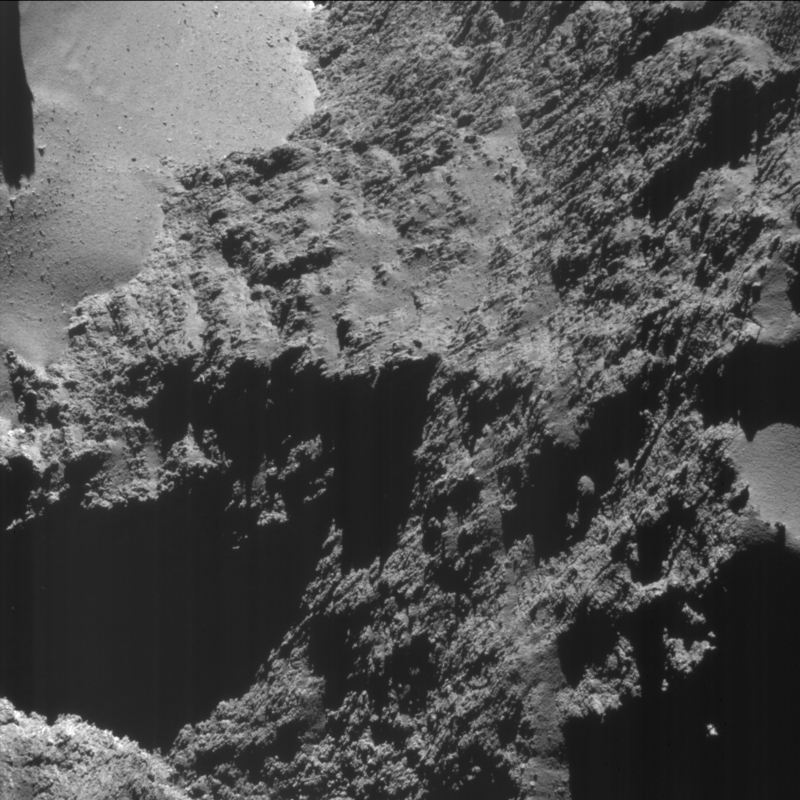 The location where the lander Philae was recently found is not far away, beyond the right edge of the image. This view reveals the great variety of terrains on the overall flat Wosret region, with some patches of smooth material (just below and left of the image centre) and a multitude of fractures and other linear features crossing the surface. Meanwhile, 264 NAVCAM images covering the period 27 July to 9 August 2016 were released earlier this week and are now available in the Archive Image Browser. The original NAVCAM images are provided below. Einzigartige wissenschaftliche Erkenntnisse bis zum Schluss: Rosettas aufregende Mission findet mit ihrem Ende am 30. September und dem Abstieg in einen Bereich aktiver Senken am ‘Kopf’ des Kometen gleichzeitig ihren Höhepunkt. Die Ma’at genannte Region liegt auf dem kleineren der beiden Teile des Kometen 67P/Tschurjumow-Gerassimenko. Dort befinden sich mehrere aktive Senken mit einem Durchmesser von über 100 m und einer Tiefe von 50–60 m. Einige der Staubstrahlen des Kometen haben dort ihren Ursprung. Die Wände der Vertiefungen weisen außerdem einige eindrucksvolle metergroße klumpige Gebilde auf, die ‘Gänsehaut’ genannt werden. Die Wissenschaftler glauben, es könnte sich um Anzeichen früher Kometenteile handeln, die sich dann in der Entstehungszeit des Sonnensystems zu einem größeren Kometen zusammengebacken haben. Rosetta wird am 30. September einen sehr genauen Blick auf diese faszinierenden Gebilde werfen können: Die Sonde visiert einen Punkt neben einer 130 m breiten, gut definierten Senke an, die vom Missionsteam in Anlehnung an eine ähnliche Formation in der gleichnamigen altägyptischen Stadt Deir el-Medina genannt wurde. Wie die archäologischen Artefakte, die in der altägyptischen Senke gefunden wurden und die den Historikern über das Leben in jener antiken Stadt Aufschluss bieten, enthält auch die Senke des Kometen Hinweise über die geologische Geschichte jener Region. Rosetta zielt auf einen Punkt in einem elliptischen Bereich von etwa 700 x 500 m in der Nähe von Deir el-Medina ab. Seit dem 9. August umrundet Rosetta den Kometen in elliptischen Orbits, die die Sonde schrittweise näher an den Kometen bringen – bei einem besonders nahen Überflug befand sie sich nur 1 km von der Kometenoberfläche entfernt – näher als je zuvor. “Obwohl wir Rosetta nun bereits zwei Jahre lang um den Kometen fliegen, stellt das sichere Manövrieren in den letzten Wochen der Mission in dieser unvorhersehbaren Umgebung des Kometen und in dieser unglaublich großen Entfernung von der Sonne und Erde unsere größte Herausforderung dar”, meint Sylvain Lodiot, Leiter des Kontrollteams bei der ESA. Der letzte Überflug wird am 24. September abgeschlossen sein. In den darauffolgenden Tagen werden eine Reihe erforderlicher Manöver ausgeführt, um Rosetta auf den geplanten Landeplatz auszurichten. Dabei geht die Sonde vom elliptischen Orbit um den Kometen in eine Flugbahn über, auf der sie schließlich am 30. September auf seiner Oberfläche niedergeht. This new animation visualises Rosetta's last two months of trajectories around Comet 67P/Churyumov-Gerasimenko. The animation begins in early August, when the spacecraft started flying elliptical orbits that brought it progressively closer to the comet at its closest approach. On 24 September, Rosetta will leave its current close, flyover orbits and transfer into the start of a 16 x 23 km orbit that will be used to prepare and line up for the final descent. On the evening of 29 September (20:50 GMT) Rosetta will manoeuvre onto a collision course with the comet, beginning the descent from an altitude of 19 km. The spacecraft will fall freely, without further manoeuvres, collecting scientific data during the descent. Note: The trajectory depicted was created from real data provided over the last month, but may not necessarily follow the exact comet distance because of natural deviations from the comet’s gravity and outgassing. In the three months centred around the comet’s closest approach to the Sun, on 13 August 2015, Rosetta’s cameras captured 34 outbursts. These violent events were over and above regular jets and flows of material seen streaming from the comet’s nucleus. The latter switch on and off with clockwork repeatability from one comet rotation to the next, synchronised with the rise and fall of the Sun’s illumination. How to spot the difference between ‘normal’ background activity and short-lived transient events at Comet 67P/Churyumov–Gerasimenko. Click for large image, full caption and credit info. By contrast, outbursts are much brighter than the usual jets – sudden, brief, high-speed releases of dust. They are typically seen only in a single image, indicating that they have a lifetime shorter than interval between images – typically 5–30 minutes. A typical outburst is thought to release 60–260 tonnes of material in those few minutes. On average, the outbursts around the closest approach to the Sun occurred once every 30 hours – about 2.4 comet rotations. Based on the appearance of the dust flow, they can be divided into three categories. One type is associated with a long, narrow jet extending far from the nucleus, while the second involves a broad, wide base that expands more laterally. The third category is a complex hybrid of the other two. “As any given outburst is short-lived and only captured in one image, we can’t tell whether it was imaged shortly after the outburst started, or later in the process,” notes Jean-Baptiste Vincent, lead author of the paper published today in Monthly Notices of the Astronomical Society. “As a result, we can’t tell if these three types of plume ‘shapes’ correspond to different mechanisms, or just different stages of a single process. “But if just one process is involved, then the logical evolutionary sequence is that an initially long narrow jet with dust is ejected at high speed, most likely from a confined space. “Then, as the local surface around the exit point is modified, a larger fraction of fresh material is exposed, broadening the plume ‘base’. Locations of the summer outbursts observed by Rosetta’s OSIRIS (blue dots) and NavCam (red dots) between July and September 2015, superimposed on a regional map of Comet 67P/Churyumov–Gerasimenko. Click for full caption details. The other key question is how these outbursts are triggered. The team found that just over half of the events occurred in regions corresponding to early morning, as the Sun began warming up the surface after many hours in darkness. The rapid change in local temperature is thought to trigger thermal stresses in the surface that might lead to a sudden fracturing and exposure of volatile material. This material rapidly heats up and vaporises explosively. The other events occurred after local noon – after illumination of a few hours. These outbursts are attributed to a different cause, where the cumulative heat makes its down to pockets of ‘volatiles’ buried beneath the surface, again causing sudden heating and an explosion. “The fact that we have clear morning and noon outbursts points to at least two different ways of triggering an outburst,” says Jean-Baptiste. But it is also possible that yet another cause is involved in some outbursts. 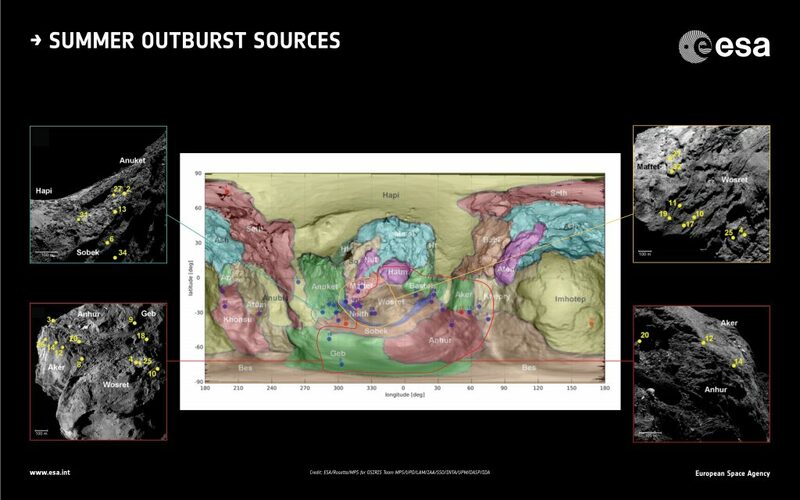 “We found that most of the outbursts seem to originate from regional boundaries on the comet, places where there are changes in texture or topography in the local terrain, such as steep cliffs, pits or alcoves,” adds Jean-Baptiste. Indeed, the fact that boulders or other debris are also seen around the regions identified as the sources of the outbursts confirms that these areas are particularly susceptible to erosion. 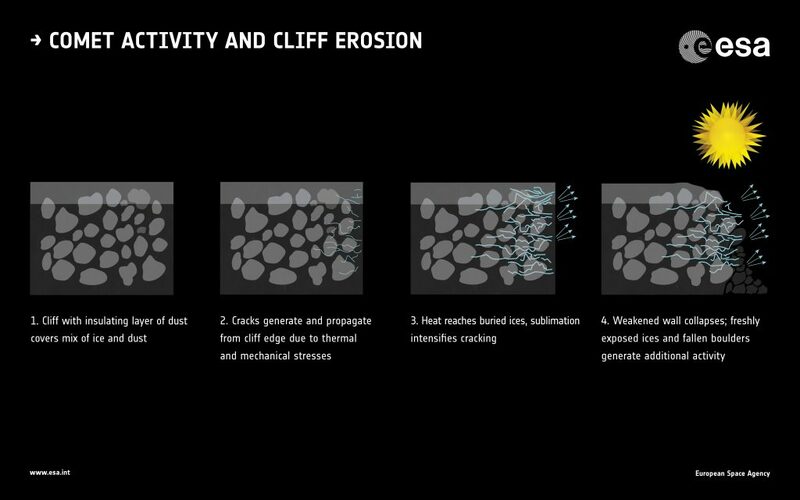 While slowly eroding cliff faces are thought to be responsible for some of the regular, long-lived jet features, a weakened cliff edge may also suddenly collapse at any time, night or day. This collapse would reveal substantial amounts of fresh material and could lead to an outburst even when the region is not exposed to sunlight. At least one of the events studied took place in local darkness and may be linked to cliff collapse. 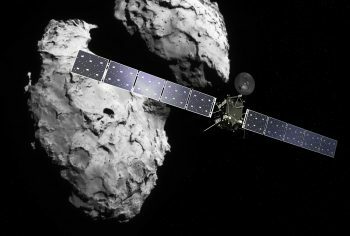 “Studying the comet over a long period of time has given us the chance to look into the difference between ‘normal’ activity and short-lived outbursts, and how these outbursts may be triggered,” says Matt Taylor, ESA’s Rosetta project scientist. 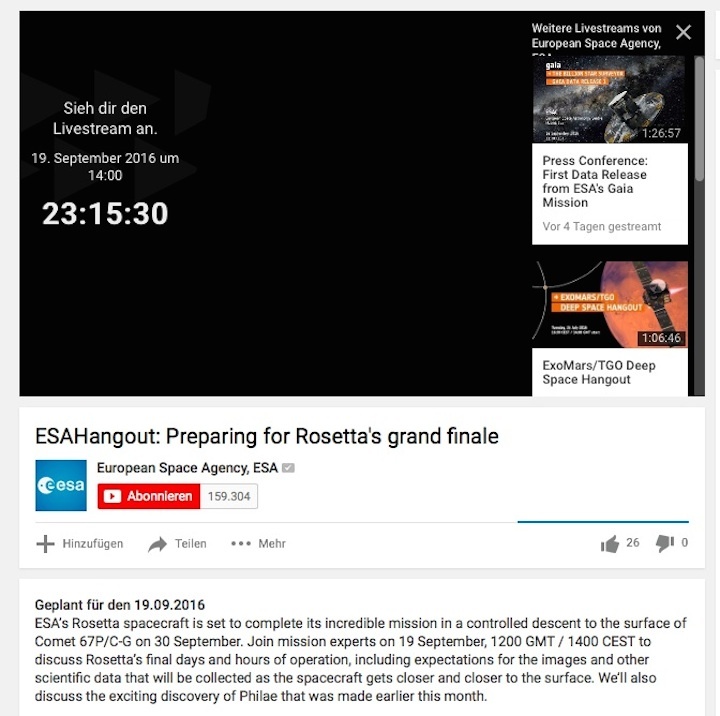 As the Rosetta mission draws to a close next Friday, 30 September 2016, the CometWatch team here at ESA realised that this will be the last 'regular' entry of this popular feature on the blog (*) through which we have shared a great deal of views of Comet 67P/Churyumov-Gerasimenko taken with Rosetta's navigation camera (NAVCAM) since July 2014, shortly before Rosetta's arrival at the comet. The image depicts the dust-covered terrains of Ma'at, on the small comet lobe, where Rosetta is destined to make a controlled impact next week. The spacecraft will aim at a point just right of the image centre, next to Deir el-Medina, the large pit located slightly below and to the right of centre in this view. 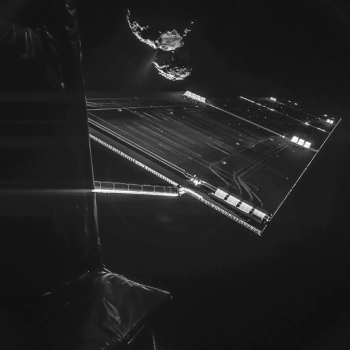 At the scale of today's CometWatch – 1.0 m/pixel – the main structure of Rosetta would span roughly 2 x 2 pixels; taking into account its two solar panels, the entire structure would span about 32 pixels across. Deir el-Medina is about 130 m-wide and, like other pits located in the Ma'at region, exhibits intriguing metre-sized lumpy structures called ‘goosebumps’ on its internal walls. During the descent, Rosetta will collect unprecedented close-up views of these structures, which scientists believe could be the signatures of early ‘cometesimals’ that assembled to create the comet in the early phases of Solar System formation. In the composite image below, Rosetta's planned impact point in Ma’at is shown – with an approximate indication of the targeted 700 x 500 m ellipse – in the context of the small lobe of Comet 67P/C-G, together with Philae’s first and final touchdown sites. (*) Don't despair, there will be more NAVCAM images taken during next week, which will be later shared on the Archive Image Browser.